If you watched my video about Comet 46P Wirtanen, you may have noticed that my imaging gear included a Canon EF 300mm F/4L USM Lens. This may have seemed a little odd to those that are used to seeing me use a telescope for astrophotography, but a camera lens like this can be a great way to capture deep sky images. Over the years, a lot of people have asked me why they should invest in a new telescope when they already own a high-quality telephoto camera lens with a comparable focal length. After all, a prime lens like the Canon EF 300mm F/4L isn’t cheap, and its got some seriously impressive optics. 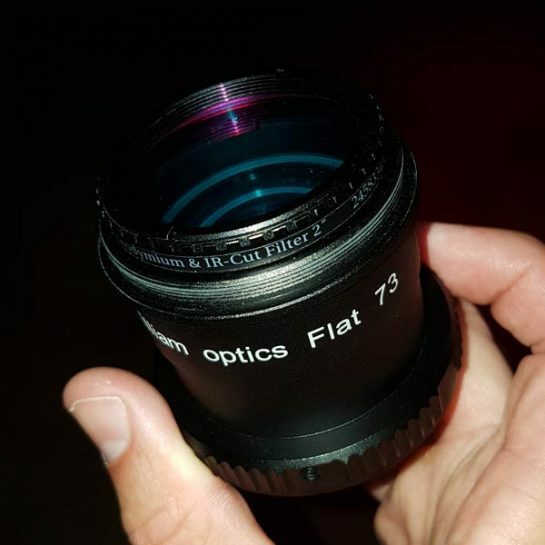 So, if you’ve already got a lens like this in your kit, you should definitely try using it for astrophotography before investing in a new telescope. 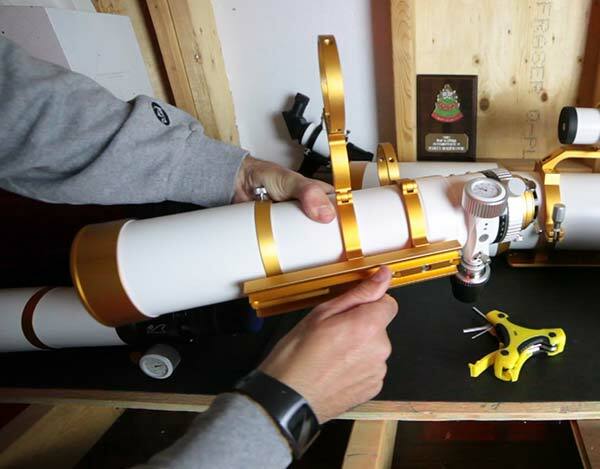 Make no mistake, a telescope designed for deep sky astrophotography has many advantages in terms of deep sky astrophotography. 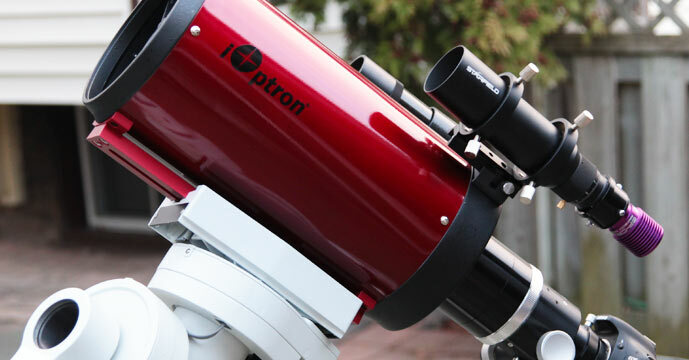 Specialized features such as a robust dual speed focuser, light baffles, and the ability to easily accommodate astronomy cameras and autoguiding systems to name a few. But if you’ve been into photography for a while, there’s a good chance you’ll already own some camera lenses that are perfect for astrophotography. 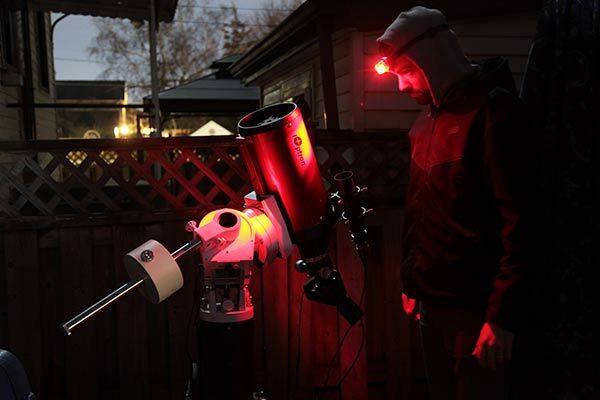 The secret is, to leverage the tracking abilities of an equatorial mount that allows you to capture long exposure images of the night sky without star trailing. In this post, I’ll show you how I managed to capture an impressive portrait of the Orion Nebula using a 300mm camera lens from my backyard in the city. I’ll discuss the filter I recommend, the camera settings I use, and the share the process of capturing long exposure images on a tracking mount. The camera lens I am using is a first generation Canon EF 300mm F/4L (Non-IS). This is an old L-series lens from Canon that does not include Image Stabilization, but does include the ring type USM autofocus motor. Features like IS and autofocus won’t work for astrophotography, so older prime (non-zoom) lenses like this are a great value in the used market. It’s quite useful to have prime lenses at different focal lengths in your astrophotography kit. 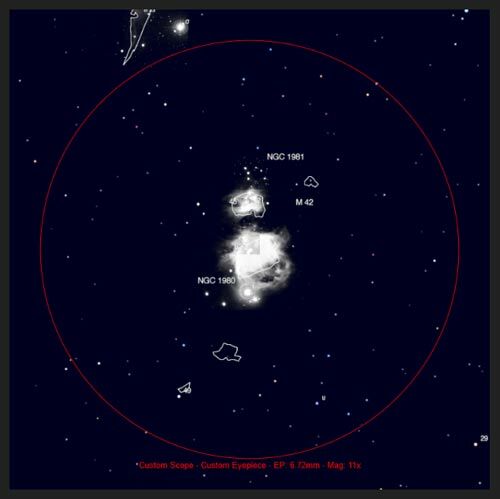 You’ll be able to capture a wide variety of targets from large open star clusters to emission and reflection nebulae like Orion. I purchased my 300mm F/4L used, and drove a fair distance to meet the seller. The lens was originally intended for bird photography, which I still enjoy today with a 1.4 extender attached for more reach. 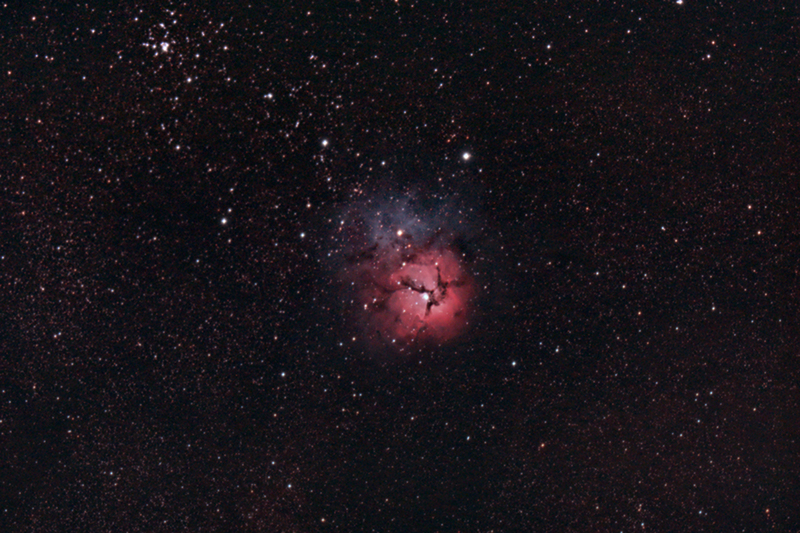 The native focal length of 300mm and widest aperture are a better configuration for astrophotography purposes. The 1.4 x Canon teleconverter introduces chromatic aberration, and I lose a full stop of light (F/5.6). This is not usually an issue in my daytime photography images, but it’s out of the question when photographing stars. Using the Canon 300mm F/4L lens on a crop-sensor DSLR (APS-C) camera like my Rebel T3i will effectively create a narrower field of view than a full-frame camera does. This creates an equivalent focal length of 480mm with the crop factor applied (1.6X), which is important to consider when framing up an astrophotography target. Using a simple FOV (field of view) calculator, you can get a preview of the expected image scale of your target. As you can see, the Canon 300mm F/4L and Canon EOS 600D combo frame the Orion Nebula and Running Man nicely. Most of the astrophotography telescopes I recommend for beginners hover around the 400mm to 700mm focal length mark, so this camera lens is quite comparable. Also, the Canon EF 300mm F/4L Non IS contains two UD (Ultra low dispersion) lens elements similar to the construction of an apochromatic refractor. 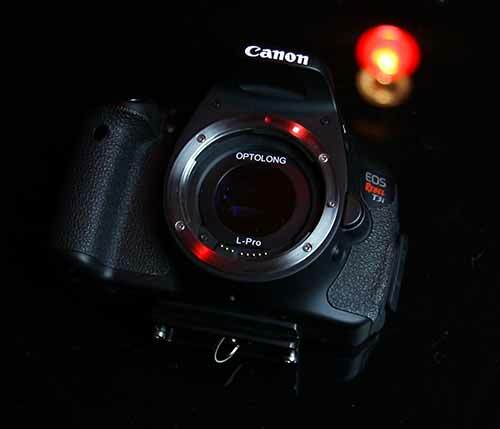 The rather fast optics of this lens (F/4) is advantageous for night photography, as its widest aperture will allow plenty of signal (light) to be collected in each shot. For comparison, my Sky-Watcher Esprit 100 APO has an F-Ratio of F/5.5. When it comes to acquiring astrophotography data for a healthy signal to noise ratio, a camera lens with a fast aperture is recommended. This is why camera lenses like the Rokinon F/2.8 and Canon F/1.8 are excellent choices for astrophotography. Finding a precise focus using a camera lens is much more difficult than it is with a telescope. Rather than using a smooth dual-speed micro focuser, you have the challenging task of using the rather sensitive focusing ring on the lens (in manual mode of course). 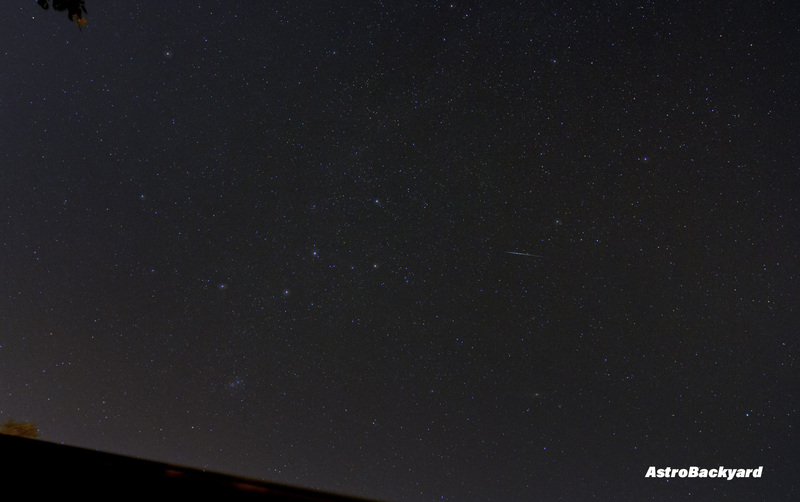 It’s best to point the camera towards a bright object (not a star) to find the initial focus. The Moon, or a distant streetlight will do. Once you have it dialed in using the lenses widest aperture (F/4), you can then aim the lens at a bright star in the night sky using your cameras highest ISO setting. From here, it’s a matter of trial and error until you find the sweet spot. Once you’ve found it, be very careful not to bump it out of focus when slewing to your target. You can always fine tune the focusing ring on your deep sky target using short test exposures after. This Rebel T3i (600D) camera has been “modified” for astrophotography, which isn’t nearly as complicated or technical as it sounds. I’ve basically removed an internal filter that blocks certain wavelengths of light from being recorded on the sensor (I didn’t modify this 600D myself, it was done by a professional). The stock internal IR cut filter found in DSLR cameras like the Canon Rebel T3i creates “normal” looking daytime images, but can hold your astro images back. 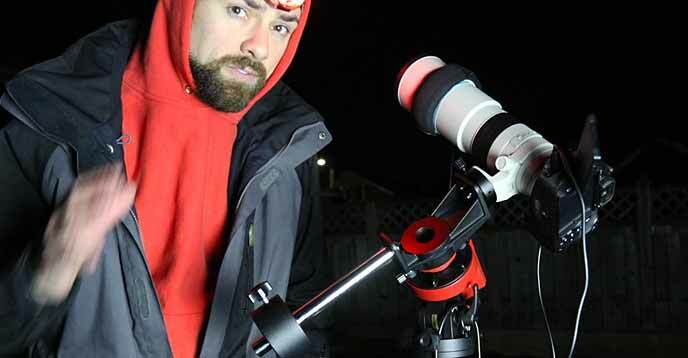 If you own a DSLR camera that you want to use for astrophotography, look into getting it modded. I waited almost 4 years before making this upgrade, and it significantly improved my astrophotography images. This modification will better showcase the rich areas of hydrogen gas in the Orion Nebula. 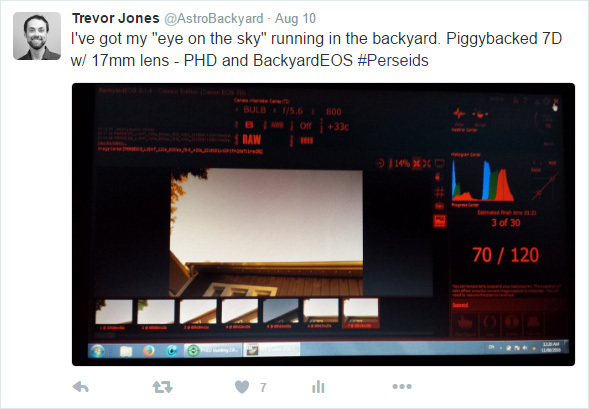 For certain deep sky targets (such as the California Nebula) a full-spectrum modified DSLR is essential for a respectable image. The Orion Nebula isn’t one of them! A stock DSLR camera can capture exquisite images of this reflection/emission nebula with beginner-level equipment. To photograph Messier 42, I’ll shoot a series of 1.5-minute exposures at ISO 400. 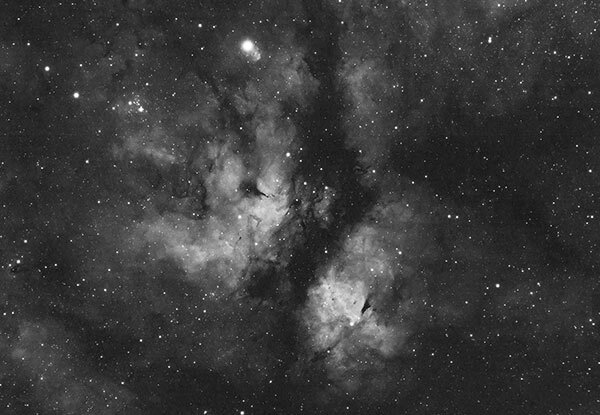 The images will collect a healthy amount of signal (or light) on this nebula and the surrounding area. With the temperature hovering around zero on the night of acquisition, I benefited from a cool camera sensor that didn’t produce nearly as much noise as I experience in the summer. Covering the sensor is an Optolong L-Pro filter. 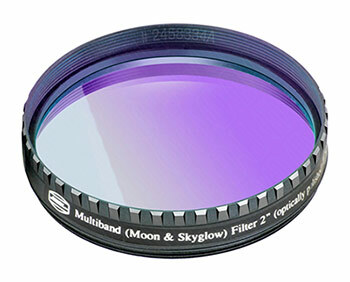 This broad spectrum filter is an excellent choice if you are looking to produce natural looking astrophotography images in the city. Light pollution is a big problem for many amateur astrophotographers, and filters like the L-Pro can make your life easier. This filter clips-into the camera body, and fits neatly underneath the camera lens. Being able to use this filter with either a camera lens or telescope attached is a real bonus. I have also used this filter underneath the Rokinon 14mm F/2.8 lens for some wide angle shots of the night sky from home. 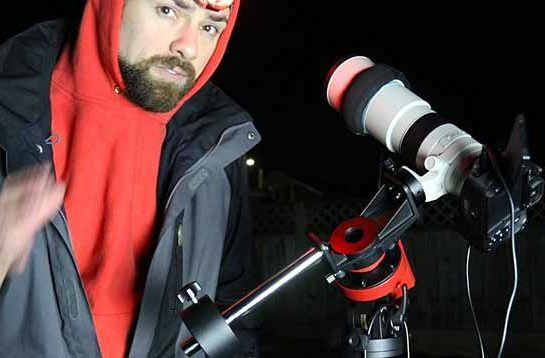 The iOptron SkyGuider Pro is the perfect solution for those looking to get started in astrophotography with a DSLR camera and lens. 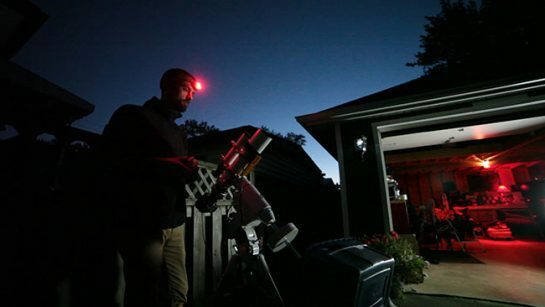 It’s a highly portable, non-nonsense astrophotography mount that allows you to start tracking the movement of the night sky for long exposure imaging. 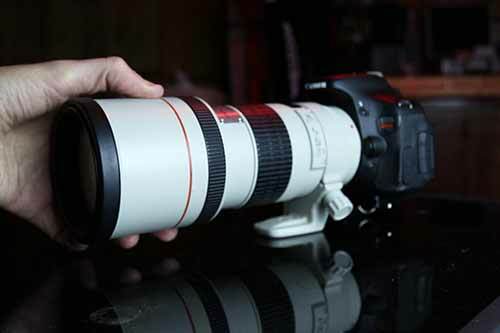 With the counterweight attached, it can handle heavier lenses like this 300mm F/4L, and even a small telescope like the William Optics Z61. For this mount to be effective, it must be accurately polar aligned. In the northern hemisphere, we have the advantage of being able to use the north star, Polaris, to help us align with the polar axis of the Earth. To start tracking, its a simple as turning the SkyGuider on, with the mode set to 1X sidereal rate. After that, the camera mount slowly matches the apparent rotation of the night sky, and my long exposure images record pin-point stars without trailing. The SkyGuider pro includes an illuminated reticle that you can use as a guide to align the mount. 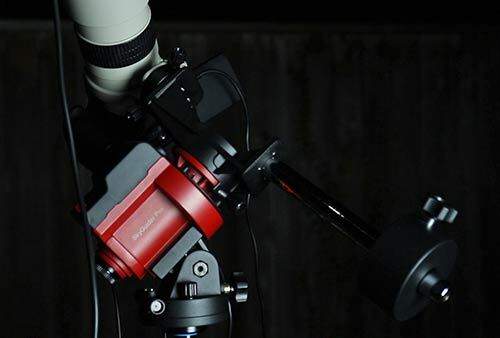 This make it really easy to get your alignment just right – which is critically important for astrophotography. Polar alignment and balance will make the biggest impact on your images. The farther off you are in either area (balance and polar alignment), the shorter your exposure times will need to be. 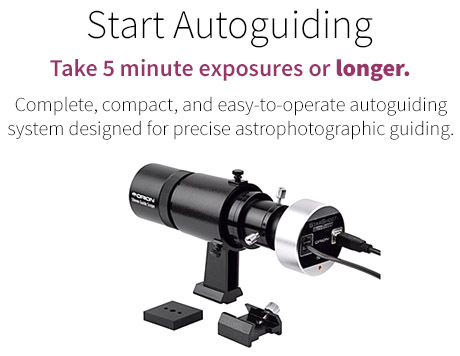 With a sound polar alignment and a careful balance, unguided exposures of 3 minutes or more are no problem on the iOptron SkyGuider Pro mount. To locate and frame a deep sky target using this mount, it must be done manually (no GoTo functionality). For bright targets like the Orion Nebula, this is extremely easy, as I can line up the target using the viewfinder on my DSLR camera. For faint targets, or when using a narrowband filter, you may need to take a number of test exposures to get it framed just right. I personally have the SGP mounted to a lightweight carbon fiber tripod. This is a highly portable configuration, but it’s likely a little too flimsy for folks that want a rock-solid platform. Consider using a more robust aluminium tripod with this mount. The bright moon certainly isn’t helping me capture the faint dusty details surrounding Orion. 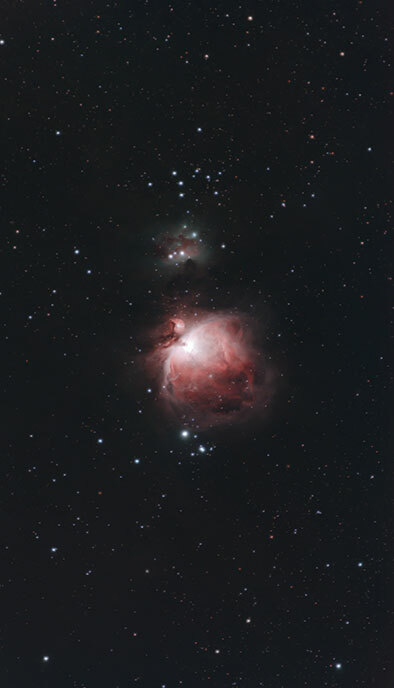 Luckily, M42 is such a bright deep sky object that it can be enjoyed in less than perfect conditions. I’ve photographed this target so many times, and it never gets old. It’s a spectacular target to test new equipment on, because you are bound to get a rather impressive image no matter which approach you take. The light pollution filter used (Optolong L-Pro) did a great job of reducing the unwanted artificial light present in my backyard, allowing the natural star colors to shine through. To create my final image, I’ve stacked the individual exposures together using a free software called DeepSkyStacker. The resulting was then brought into into Adobe Photoshop for further processing. 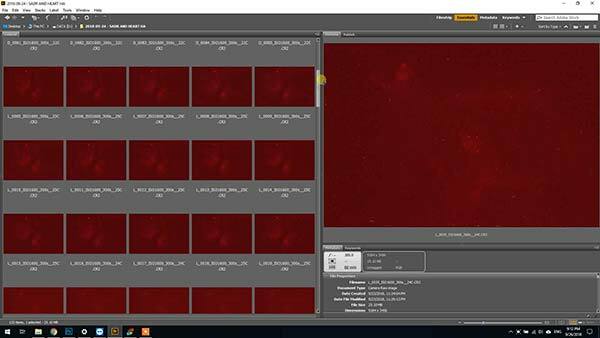 If you want to learn how I process my astrophotography images, have a look at some of the image processing tutorials I’ve shared in the past. 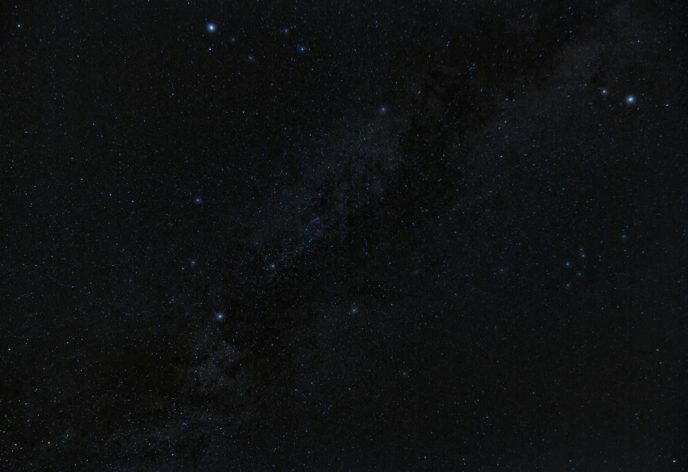 As you can see in my image above, the stars are sharp and free of chromatic aberration (color fringing). This is a testament to the high quality optics of the 300mm F/4L lens, and an important factor to consider when choosing a camera lens for astrophotography. Capturing sharp, accurately colored stars is the ultimate challenge for optical equipment, and the Canon EF 300mm F/4L passes with flying colors. The field is also extremely flat, another trait of only the best camera lenses. A prime telephoto camera lens like the Canon EF 300mm F/4L is a great way to capture deep sky astrophotography images, as long as you’ve got a way to track the night sky for each shot. The wide field of view is very forgiving, meaning autoguiding isn’t necessary for a successful long exposure image. Whether you’re using a camera lens, telescope, or a pair of binoculars. I hope you’re able to get out and appreciate the impossibly beautiful history of our universe that shines above our heads this season. Astrophotography Cameras – What’s the Best Choice for Beginners? 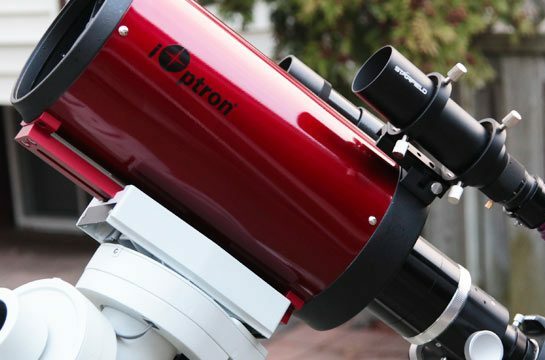 I’ve been given the unique opportunity to review a new Ritchey-Chrétien Telescope, the iOptron Photron RC6. This telescope has a longer focal length than any of my refractors, which I plan on putting to good use. The impressive 1370mm focal length means that this stocky red Ritchey-Chrétien is a perfect choice for astrophotography during galaxy season. I’m looking forward to some large, high-resolution images of galaxies such as M101, the Pinwheel Galaxy. With this added “reach” also comes an increased demand for focus and tracking accuracy. Added challenges include a strong need for an effective plate-solving solution, as locating deep sky objects at this magnification can be very time-consuming. These issues are not nearly as apparent when dealing with wide-field refractors, and one of the countless reasons I recommend them to beginners. Although the iOptron RC6 telescope presents a new learning curve, it also means that I’ll be photographing a deeper view of space than ever before. Until now, I’ve only photographed galaxies through wide-field imaging telescopes such as refractors and Newtonian reflectors. A Ritchey-Chrétien telescope is a much better fit for smaller deep-sky targets, including many of the galaxies up for grabs at this time of year. The increased magnification means that smaller galaxies will appear in higher resolution, and take up more real estate in the frame. 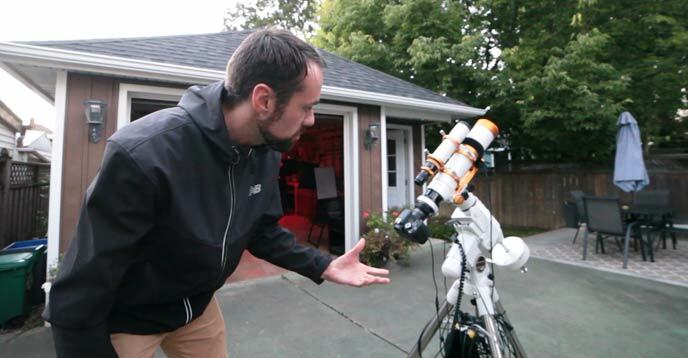 The iOptron Photron RC6 is a Ritchey-Chrétien telescope, the first of its kind to ever grace my backyard. By design, an “RC” telescope uses hyperbolic primary and secondary mirrors. Compared to a traditional Newtonian reflector design, this RC6 is said to offer a coma and chromatic aberration free results. Quite an impressive feat for a modest 6-inch diameter telescope with a conveniently stocky design. Mounting the tube to my equatorial mount is quick and easy, as the stubby design of the RC6 is compact and easy to manage. 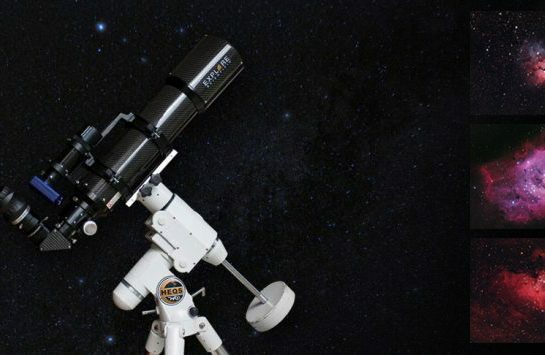 The Ritchey-Chrétien design is known for its great imaging performance, which is why you’ll find this design used in large professional telescopes including the Hubble Space Telescope. The RCT sitting in my backyard is just a few meters smaller than the HST, but the little iOptron Photron has the heart of a champion. The Photron includes a 2″ dual-speed Crayford focuser. This is a nice touch for a telescope that will need to execute precision adjustments when in use for deep sky astrophotography. The design of the fixed primary mirror is said to eliminate the image shift that other telescope designs can suffer from. I have not experienced this phenomenon myself (or I didn’t notice), but perhaps any readers that have used a Newtonian reflector can weigh-in on this subject in the comments. 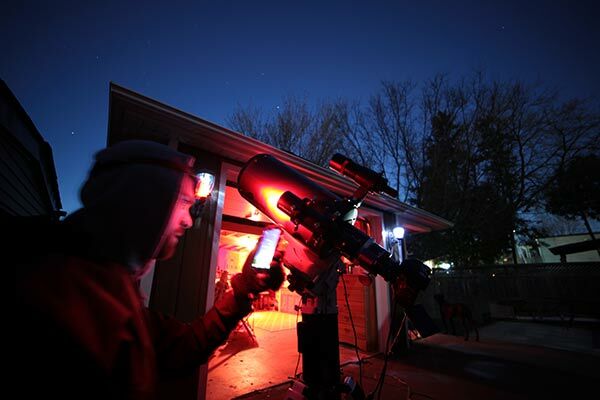 The iOptron Photron RC6 was built for astrophotography. Its steel tube includes internal knife-edge baffles that reduce the stray light entering the objective of the scope. In a long exposure photo, the smallest amount of stray light can become quite bright, and it reduces the overall contrast of your image. Light baffles are present in most of the astrophotography telescopes I have used, but its a nice feature nonetheless. I’ll take all the help I can get when it comes to reducing the negative effects of light pollution from home. Similar variations of this particular Ritchey-Chrétien model exist, each with its own particular flair. Previously I have seen a lot of fantastic images taken using the Astro Tech RC6, or ATRC6. Browsing equipment photos of this version of the telescope being used for deep-sky astrophotography was helpful when trying to determine the correct back focus for my camera. 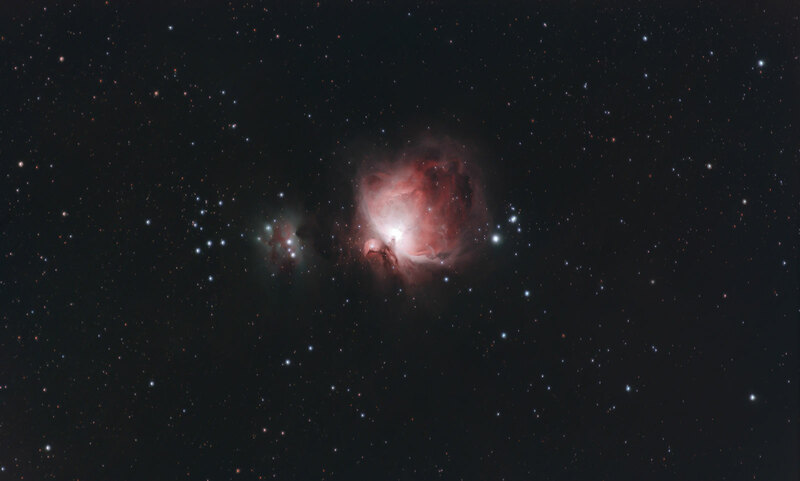 I’ve spent a number of astrophotography imaging sessions using an Orion 8″ F/4 Newtonian reflector telescope. Unlike this RC, the reflector required constant collimation adjustments, and a coma corrector to produce a flat imaging field. A coma corrector is an essential added expense for anyone looking to take pictures with a “Newt”. In the case of my Orion 8″ astrograph, the Baader MPCC II (coma corrector) cost nearly as much as the OTA itself. 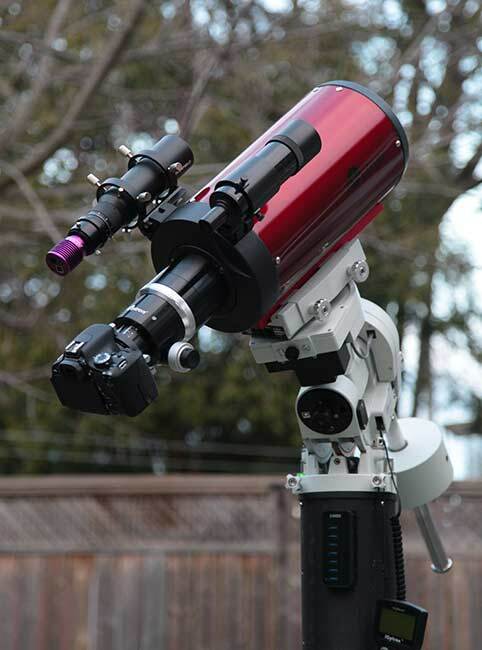 A small apochromatic refractor telescope such as the William Optics Z61 is much easier to use than an RCT. The compact size and forgiving wide field of view make the entire deep sky astrophotography experience less labor intensive. The drawbacks of a small apochromatic refractor telescope are their high price tag, and short focal lengths. As convenient and versatile as they may be, a Ritchey-Chrétien telescope is a better choice for capturing small targets such as galaxies. I received an early demo model of the RC6 in late 2017, and am only just now getting chance to use it. 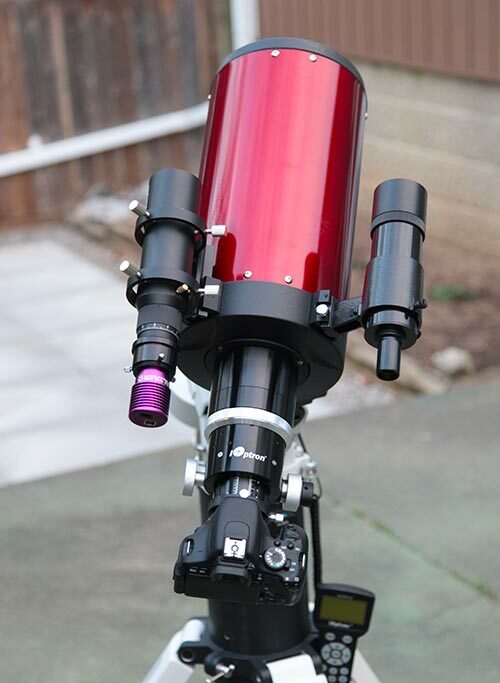 The vibrant red finish of this telescope is hard to ignore. This was evident with the audience at NEAF 2018, where iOptron displayed several sizes of the Photron RC in matching red on the show floor. This is my first iOptron telescope, and I have high expectations based on the tremendous experiences I’ve had with their reliable astrophotography mounts. The included dovetail bar comes in matching anodized red paint, which I promptly marked up after securing it into the base of my mount. Speaking of mounting the telescope, I had a bit of tough time properly balancing the load, particularly with a guide scope attached. Luckily, the RC6 includes not only a finder scope base on the left-hand side but drilled holes to easily add another finder/guide scope base on the right side. This option proved to be the perfect solution to my balancing issues. I mounted an old finder scope to the newly installed base to for better balance, and a useful way to align the RC6. I’ve accumulated a number of telescope accessories from previous ‘scopes over the years, which is handy in situations like this. The finder scope I’m using was an Orion 9 x 50 Achromat I ordered years ago. Having a few extra accessories including finder scope brackets and bases can be a lifesaver in a crunch. 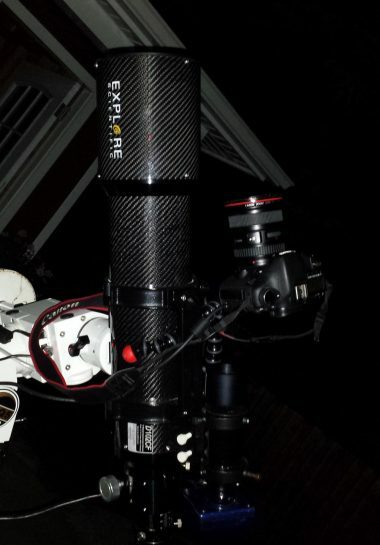 I’ll be adjusting the focus of the telescope manually during my astrophotography sessions on the RC6. iOptron does offer an electronic focuser built exclusively for their Ritchey-Chrétien telescopes, which will set you back about $200 USD. This is a nice available upgrade, which would certainly come in handy when fine-tuning the focus on a distant galaxy. 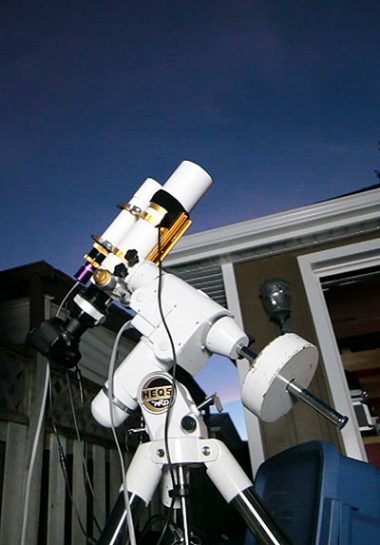 If you’re looking to install an aftermarket focus motor to your telescope, be sure to check out my experiences using this model from Pegasus Astro. The iOptron CEM60 mount is more than capable of giving the RC6 a smooth ride. 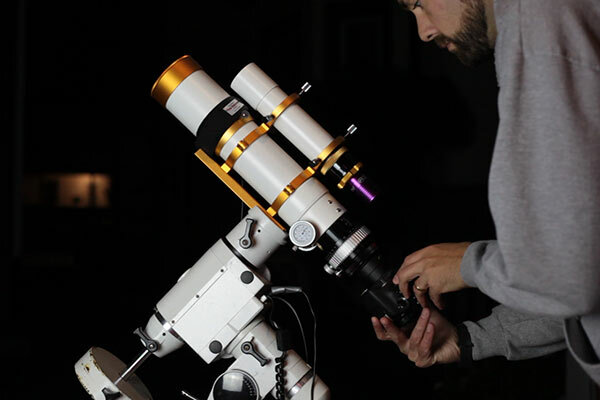 The telescope and all imaging accessories fall well below the maximum payload capacity of the mount, meaning any minor balance issues are unlikely to affect autoguiding. The auto guiding telescope I am using is a new StarField 50mm F/3.4 model, from Ontario Telescope and Accessories. This has replaced my old Altair guide scope but continues to house the reliable and no-nonsense Altair GPCAM2 AR0130 mono guide camera. I’ll have much more information about the Starfield line of products including the reducer/flattener in the near future. I was happy to see that iOptron made the effort to include the necessary accessories needed to reach focus for astrophotography. The RC6 includes three focuser extension rings for a variety of back focus applications. 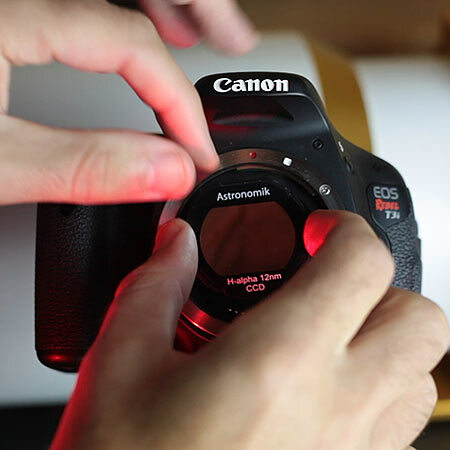 For my Canon DSLR camera, I found focus using the 1″ and 2″ extension tubes as seen in the image below. To reach focus on the iOptron Photrom RC6 with a DSLR, use the 1″ + 2″ extension tubes. If you’re having trouble reaching focus with RC6 and your particular camera, try setting up during the day (that’s what I did). This year, our Canadian winter lasted well into the spring. The sky was cloudy for weeks on end, meaning I didn’t have a single star to focus on. Instead, I used a distant street light to find focus. 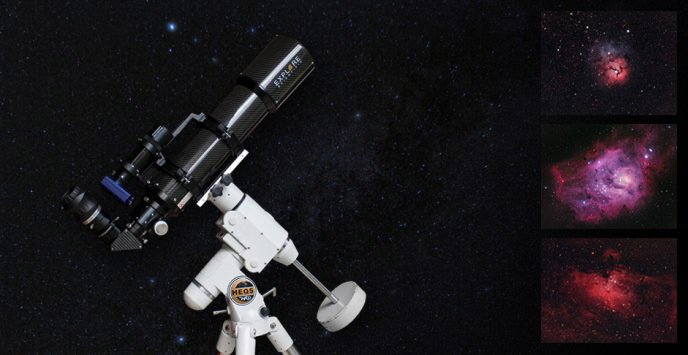 At a focal ratio of F/9, this telescope produces a dim view through the eyepiece. You’ll need to use a bright object if your focusing at night. Once you have found focus on your test subject, you can mark the location on the focuser, take a photo of it, or simply keep it locked in. 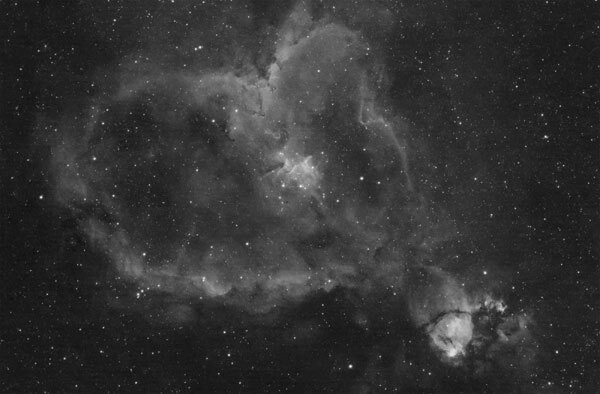 The idea is to have a benchmark to use when you’re ready to start imaging with the RC6 on a clear night. You’ll have to tweak the focus on a real star of course, but you should be close. Without knowing the correct back focus of a new telescope with your camera, it can take hours to find the right combination of extension tubes. The iOptron RC6 has a long focal length and a slow focal ratio (F9), making this process more difficult than it is with a fast little refractor. 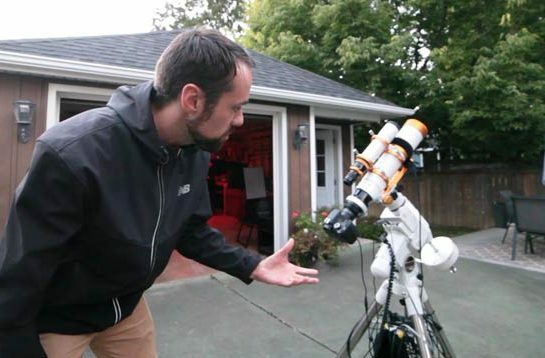 Which Camera to use with a Ritchey-Chrétien Telescope? 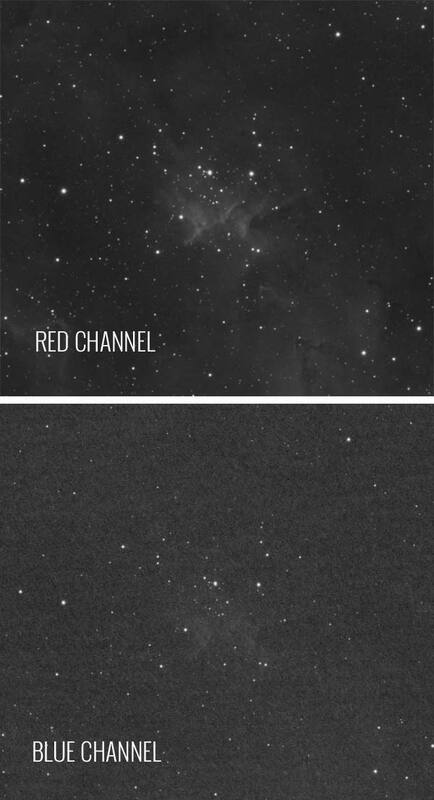 When it comes to choosing the “right” camera to use for a particular telescope, understanding pixel scale is essential. This involves the correlation between the size of the imaging chip (camera sensor), and the telescopes focal length. Most planetariums and imaging software programs will calculate the most common camera chip sizes for you, or you can do the math for yourself. 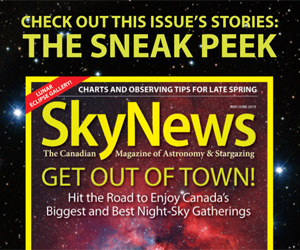 Richard Wright shared an excellent article on pixel scale for astrophotography in this Sky and Telescope article. To be quite honest, I haven’t spent too much time obsessing over exact pixel scale details in the past. I know that my wide field refractor will capture the entire Soul Nebula with my Canon DSLR and that the ED102 frames the Cone Nebula and friends up nicely with the 183M. This is a result of my trial-and-error approach to astrophotography I somehow crave, but I understand why this isn’t for everybody. 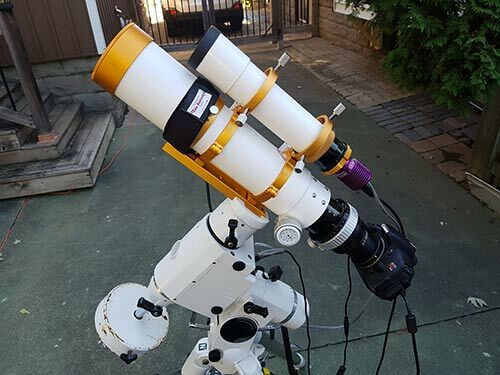 Based on the sound advice from my good friend Steve Mallia at Ontario Telescope, I have decided to use my APS-C sensor Canon EOS T3i (600D) with the iOptron RC6. Because a longer focal length shrinks the area of sky you see, the larger imaging chip in this DSLR is a better fit with the focal length of the Photron. 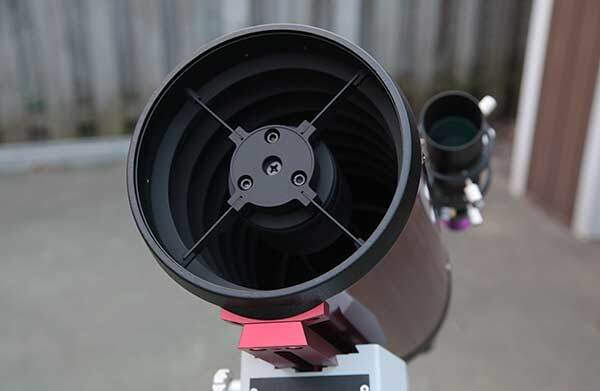 Combining this telescope with a camera that houses a small imaging chip such as the Altair Hypercam 183M would make for an extremely restricted field of view. I decided on the stunning Pinwheel Galaxy (M101) as my first deep-sky target with the RC6. 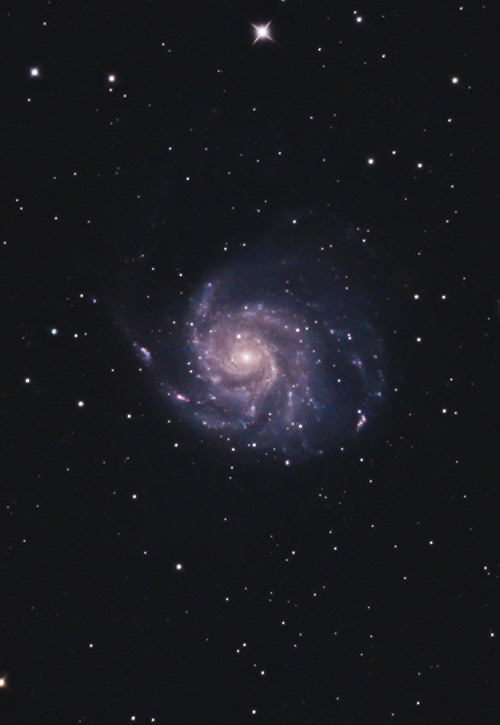 The size and magnitude of M101 make this spiral galaxy a good fit for my full-frame DSLR camera. Historically, April and May are a great time of year to capture some serious light on this deep-sky target. The Pinwheel is one of many fine galaxies up for grabs during “galaxy season“. Unfortunately, my test image was captured under an 82% illuminated moon, on a night that also suffered from poor seeing and transparency. The following photo was made using 70 x 4-minute exposures. (4 Hours, 40 Minutes). The images were integrated with support frames including dark, bias and flat frames in DeepSkyStacker. The final stacked image was brought into Adobe Photoshop for final image processing, using the techniques outlined in this Photoshop tutorial. I looked closely at my individual light frames produced by the iOptron RC6. What I looked for was a flat field of view, sharp stars, and an increased resolution in my subject. I was thrilled to capture M101 in great detail than ever before, thanks to the increased aperture and focal length of the telescope. The image was captured during a nearly full moon, which made processing the image a challenge. Removing some harsh gradients in the final image was the biggest obstacle. I used a Photoshop technique that includes applying a synthetic flat frame and setting the blending mode to subtract. 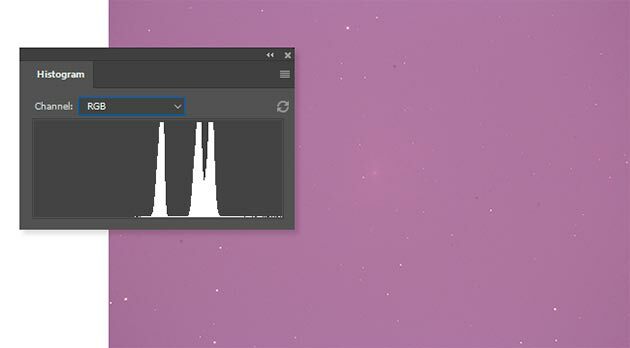 This can be a helpful strategy to use when the Gradient Xterminator plugin does not produce the results you’re looking for. As always, adding more overall exposure time and improving the signal-to-noise ratio would improve the quality of this image immensely. A Baader Moon and Skyglow filter helped reduce the effects of light pollution in my images and made a big difference in terms of overall contrast. I mounted the 2″ round version of the filter to nosepiece of the camera. 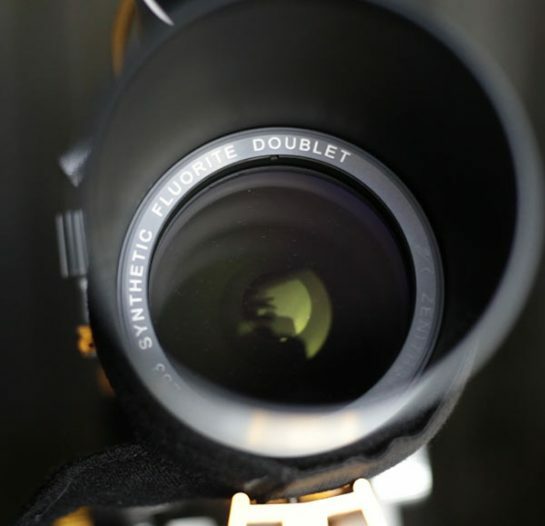 The 2″ round mounted version offers the flexibility to shoot using a variety of dedicated astronomy cameras and DSLR’s. Of all the light pollution filters I have used for astrophotography from the backyard, this particular Baader model is one of my favorites. 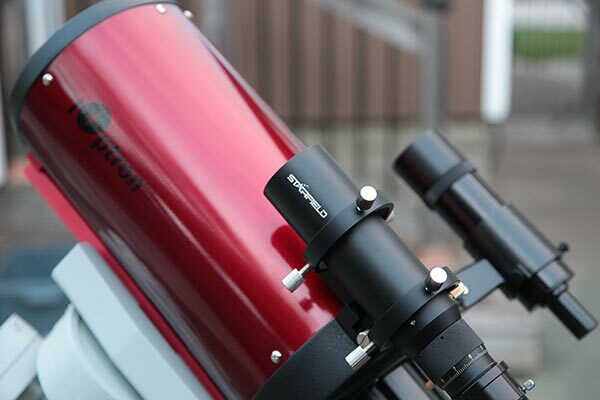 The iOptron Photron RC6 telescope was a pleasure to use, and provided the deep sky results I was looking for. The optical quality of the Ritchey-Chrétien design produced flat, coma and chromatic free results as advertised. Surprisingly, this F/9 focal ratio did not reduce the amount of light collected in my image subs the way I expected. 3-minute exposures at ISO 1600 were well exposed, likely due to the increased 150mm aperture of the telescope. Take a look at the dramatic difference in magnification between the following two images of the Pinwheel Galaxy. The version on the left was captured using a crop-sensor DSLR with an 80mm refractor telescope, while the version on the right used the new iOptron Photron RC6. As you can see, an RCT is a much better fit if you want to collect close-ups of smaller DSO’s like the Pinwheel Galaxy. Those of you that shoot with a DSLR camera should have no issues in terms of pixel scale with the RC6. An APS-C sized sensor is a great match with the focal length of this telescope. My image of the Pinwheel Galaxy should give you a good idea of the field of view you can expect to see through the Photron. 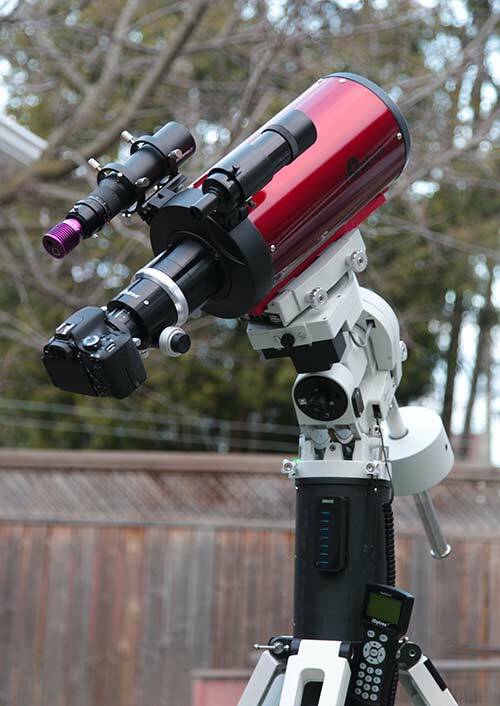 At just 18lbs, the iOptron RC6 requires a modest equatorial mount for accurate and smooth tracking. The iOptron CEM60 is overkill for this OTA, and I think an Orion Sirius EQ-G or similar mount would be more than enough to carry a complete imaging payload. The RC6 fills a noticeable void in my arsenal of optical instruments. Having a no-nonsense telescope that excels in high magnification targets such as small galaxies has given me a more complete set of tools for capturing deep sky objects of all sizes. Next up, I’ll focus on capturing some of the smaller galaxies I have traditionally avoided due to lack of reach. 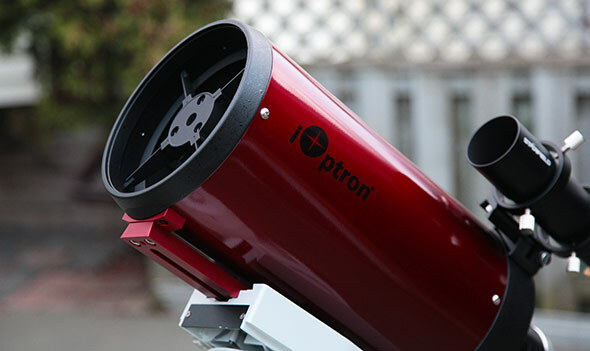 The iOptron Photron 6″ Ritchey-Chrétien telescope is available at Ontario Telescope and Accessories.